Thank you very much for the whole trip…and especially for the selection of sites and teaching us how to see the whole picture, how to notice the key things that affect the whole area, how to recognize the forms, focus on what you can do and see and much more. Those student who wish to seek career guidance advice may contact us here. 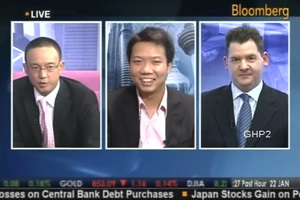 Joey Yap was invited by Bloomberg Television to appear on its TV talk show, Bloomberg Voices. Hosted by Bernard Lo, Bloomberg Voices is one of the hottest talk shows in Asia that features prominent figures making waves in various industries across the Asia-Pacific region. Joey was invited to appear on the show on January 22 along with William Pesek of Bloomberg News. Joey spoke on the forecast and outlook for 2009 from the perspective of Classical Feng Shui and Chinese Astrology.